It’s a little hackneyed these days to be throwing about ‘the game X really wanted to make’ but after eight years of working on the Witcher games to get to this point, I’d be willing to concede that it might just be true in CD Projekt RED’s case. The Witcher 3: Wild Hunt has now been out for a couple of weeks now, and much of that time CDPR’s new release has held a considerable grip on my attention. Maybe that says enough; that despite a number of flaws, some noticeable technical issues with the PS4 version, and the threat of one particularly nasty bug (that has since been patched out) I pretty much couldn’t stop playing. But since we’re already here, why don’t I go into a bit more depth? I can’t say that I look back on the previous two games with much in the way of fondness. I played both of them once around the time that they originally came out and liked them well enough, and then again just before the next installment came out in order to refresh my memory, only to find that in my mind they hadn’t aged well at all. With their clunky game mechanics, uninspired writing, and generally dull or poor voice acting, playing through them again ended up being a lot more of a slog than anticipated. I think it’s safe to say that this isn’t the case with The Witcher 3. A lot of the old flaws that seemed stuck to the series like a bad odour are no longer a part of this third – and allegedly final – game. Which isn’t to say that it’s perfect. Far from it, there’s numerous little annoyances and niggles that seem to always come as part and parcel of open-world games of this scope. But that same scope makes up for a lot, and left me feeling impressed by what I experienced far more often than I was perturbed by the occasional misstep. You’ll be seeing a lot of this. There’s plenty of choices during dialogue, though often there isn’t an appreciable difference between Gruff Geralt and Surly Geralt. It may have been eight years since that first game, but CD Projekt RED are ostensibly sticking to the same style of game that they began with. 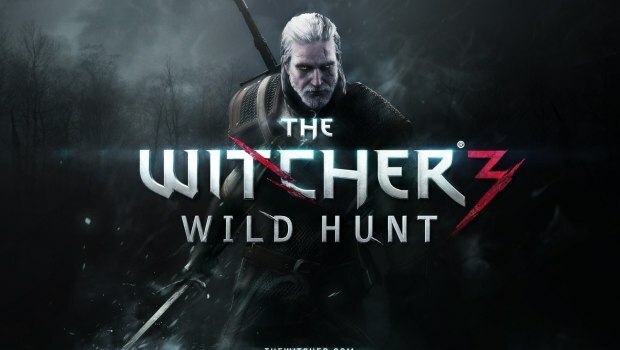 This is still an action-oriented RPG with a focus on fighting monsters, both supernatural and mundane, and telling the dark, compelling, and often grim story of Geralt’s adventures. Combat remains centred around the concept of the two swords, with steel for people or animals and silver for the monsters that Geralt hunts, as well as the magic spell-esque ‘signs’ at your disposal and an array of bombs and quaffable potions. The crossbow is a new addition to the arsenal but it’s a rather underwhelming one. Wary of dedicating precious ability points to make it worthwhile, it never saw much use in my hands beyond awkwardly grounding flying opponents or instantly killing anything if I happened to be flailing underwater somewhere (Not sure exactly how that one works, but with swimming being so poorly implemented in the game, I didn’t mind so much.). Combat has never really been a great strength of The Witcher and it certainly isn’t the main draw this time around either. But I will say it is serviceable enough, at least once you get some levels under your belt and move past some of the early frustrations of being knocked about like a Witcher-shaped ragdoll. It’s the increase in scale that is perhaps one of the game’s biggest selling points. Previously the games were fairly linear, split up into separate chapters that each had their own little town hub from where you did your business until you moved on to the next episode. But The Witcher 3 is considerably less strict with its divisions and has instead opted for a number of massive open environments, the kind that are filled with plenty of things to do, that you can freely traverse between pretty much whenever you want. The size of it all is remarkable, though I have to admit that the novelty did eventually wear off. There’s two main regions you’ll be exploring, three if you’re willing to count the game’s sprawling city of Novigrad as a region of its own, and they’re brimming with the kind of side activities that you’d expect from other open-world games like Skyrim or Assassin’s Creed. Various kinds of hidden or otherwise guarded treasures, dangerous caverns to explore, that sort of thing. At the very least you’ll probably want to hunt down all the Places of Power that you can get your hands on for the extra points they offer towards upgrading Geralt’s abilities, though with every undiscovered point of interest simply showing up as a question mark on the map, finding them might prove to be a rather time-consuming task without some extra-curricular guidance from the internet. None of this is particularly groundbreaking stuff, but there is admittedly some novelty to it being in a Witcher game, enough for me to have spent far too much time roaming about in the first real region of the game from one silly distraction to the next. By the time I’d found my way to the second explorable area I’d managed to work most of that compulsion from my system, after having realised that it wasn’t especially compulsory – or even all that rewarding after a while – to go chasing after every question mark. Exploration was a fun little novelty for a while, but at the end of the day the meat of The Witcher 3’s content is clearly in its story and its quests. This is the first Witcher game that feels like it properly captures the whole day-to-day of Witching. There’s plenty of monster hunting contracts to take on, though sadly the types of monster eventually cease to be a surprise. For those new to the Witcher games as a whole, starting at the third entry in the series might seem pretty daunting. If you’re worried about missing crucial details and context that surely must be in the previous two games, don’t be. 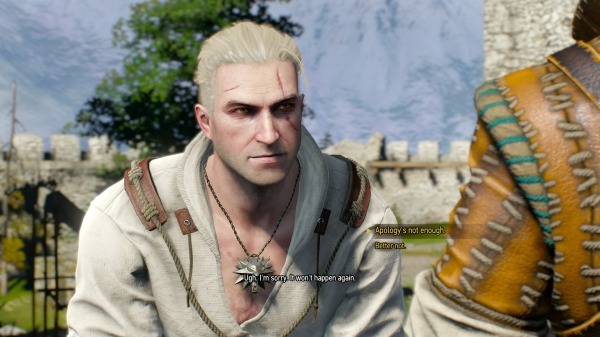 The crossover between the games is incredibly minor, and although there is an option to import story data from The Witcher 2 in the PC version (or select an option to provide that data in-game through dialogue with the console version) it just barely has an effect on your experience in the end. The choices I made through the PS4’s fairly elegant, if ultimately superfluous, interrogation regarding Geralt’s previous adventure didn’t feel like they made much of an impact at all, barring one reappearance of an old character from the previous game that felt at least a little meaningful and satisfying. It’s not a huge problem that this feature didn’t end up amounting to much, it just has the unfortunate side effect of making the previous games feel even more pointless in the scheme of things, good for little more than moving the pieces about so that Wild Hunt’s story could occur. As far as I could tell, anything that you absolutely need to know to make sense of the plot is given to you, either through dialogue or the bursting lexicon of characters contained within the game’s extensive glossary. But as I said, the story can easily stand on its own, apart from the original novels written by Polish author Andrzej Sapkowski and apart from the other games as well. Those unfamiliar with the medieval, fantasy setting shouldn’t struggle to keep up. The poor writing and voice acting that had often dragged down the previous outings of The Witcher has been noticeably improved upon, lending to a much more immersive and frankly enjoyable story that feels as if it’s being told with far more confidence and experience than I would have expected. It’s pretty simple on the surface: Geralt, a monster slayer known as a Witcher, searches for his adopted daughter Ciri while caught in the middle of a miserable war between nations. Mysterious, supernatural beings wish Ciri harm and so Geralt has to find her before its too late. It’s surprisingly well told, and though I went in sceptical about having to care about this barely-glimpsed relationship, it becomes far more convincing later on. I wouldn’t say it’s quite as impactful as the relationship between Joel and Ellie in The Last Of Us or Lee and Clementine in The Walking Dead but it hits many of the same beats and ultimately does the trick. If I have to make one complaint about the story, it’d have to be about the last few hours. Without saying too much, it feels a little bit too much like ticking off a long shopping list of loose ends that had previously been left dangling, and with only so many hours left to fit it all in. It’s a stark contrast to the pace set earlier in the game, but it’s hardly a deal breaker. The game still manages to end in a way that is both satisfying and more than a little bittersweet. It’s worth noting that you can continue to play once it’s over to wrap up any unfinished side quests you had left over, but don’t expect to see any of the consequences of your ending or any of the main characters beyond Geralt either. After a playtime that must have gone on for at least 60 hours, there was little left for me to do at that point other than stop playing. It’d be remiss not to mention anything of The Witcher 3‘s visuals. Even on the PS4 the game would often look outstanding, both in characters and environments. Faces animate in a particularly convincing manner, especially when it comes to the main cast, nicely complimenting the already convincingly expressive performances given by the cast of voice actors. Bit parts and the NPCs without names are noticeably less animated, both in the face and elsewhere, but still look great considering. Sadly, some of their strings begin to show as you start to recognise the same stock of faces reappearing, losing some of the magic that you experience when first stating the game. The environments are maybe not the most varied you’ll find in the fantasy genre – you’ll certainly get your fill of war-torn, muddy countryside – but they’re nevertheless well realised, perhaps because of this. They feel a lot more real without the icy tundra being just down the road from the balmy beach, and it’s brought to life with a vibrant use of colour. (Though thankfully far more restrained than The Witcher 2’s eye-bleeding colour palette.) But that isn’t to say that the PS4 doesn’t struggle with what it’s given from time to time. The framerate can dip noticeably in more busy scenes or during rainy weather, and the game can get downright weird when it comes to the bustle of the big city, buildings and particular characters taking a long time to load in if you get there a little too soon. Too often I found myself having to run off down the block to convince the game to finish loading in that bloody blacksmith I wanted to talk to, because it certainly wasn’t going to while I was waiting right there. But with a game of this kind of immense size, it’s not exactly surprising that the console hardware occasionally struggles to keep up. It’s nothing damaging or permanent, it just calls for some amount of patience. Sometimes a lot of it. Check out that sorrowful beard tech. There’s no denying that on some level The Witcher 3: Wild Hunt is an achievement, if not industry-wide for its sheer ambition and scale, then as a personal one for CD Projekt RED. It’s a culmination of all the things they’ve learned over the past decade in making games and it’s easily the best they’ve made so far. Not only have they made a quality open world RPG that could rival those made by the likes of Bethesda, they’ve also managed to tell an engaging story with a definitive end to boot. That’s a rare combination, almost to the point of being unique, and deserves to be applauded. 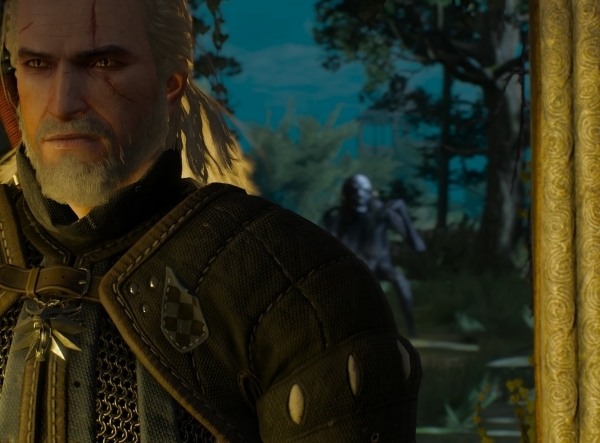 The Witcher 3: Wild Hunt is available now on PC, Xbox One, and Playstation 4. 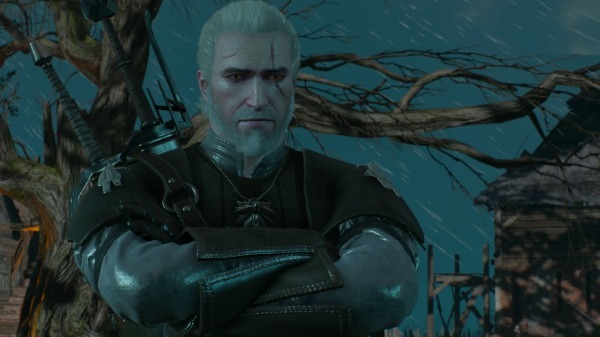 For a more humorous take on Witcher 3, check out my Geralt’s Diary pieces. Will write about movies, TV shows, and video games, but mostly just ends up writing about games! Ask me about my crippling MMO addiction.